Pre-Infusion for the Rancilio Silvia Espresso Machine. Pre-soaking or pre-infusing the grinds will not be a magical fix for all errors in dosing and extraction. Although it can help in correcting some small dosing errors, do not contribute your success, to using pre-infusion, or your failure in good extraction to not using pre-infusion. For many reasons Silvia performs very well without any Pre-infusion option. Actually, if you can perform all other steps correctly to achieve a uniform extraction, you will not see any significant improvement from pre-infusion or some other sophisticated pressure profiling. With Silvia, if pre-infusion is done incorrectly, the extraction will be worse than if there was no pre-infusion. Certainly blame your failure to using pre-infusion as a first step in correcting your failure. Pre-Infusion provides more control of the brewing process through separate activation of the ULKA water pump and the flow of water to the puck. Unfortunately, Silvia does not have the water flow control or restrictions in water flow found in commercial machines, so it is a little tricky to achieve the pre-infusion consistency results that can be obtained in a good commercial machine, but we can get close to it. Pre-soaking the coffee at zero pressure can have negative effects on the puck which can only be fixed if you compensate for potential problems (so you should really be aware of the inside). Among the many issues that can arise if you try to pre-Infuse, is an increased possibility of uneven water distribution or of creating water pathways in the puck, both of which result in a non-uniform extraction. Compensating for the potential negative effects of pre-soaking without pressure requires first grinding more finely than usual. What I think works best is to pre-infuse by delivering water at high flow to the puck by allowing a pressure of one or two bars, then pausing, and then continuing the extraction as you wish (various on/off sequences are possible with the Silvia pre-infusion option approximating the pre-infusion process in more expensive machines) and then increasing the pressure to the maximum of ~nine bars to extract the coffee. If you have any intention of using any kind of pre-infusion, you should fully understand this diagram below. Understand why never flip the brew switch "on" before the pump is running and never leave the brew switch "on" when not in brew cycle. Because of this specific boiler design we could have some amount of air trapped at the top of the boiler. This air is acting as a dampener or cushion for the force coming from the pump. In certain condition this event can be very dramatic. However, because of this specific boiler design we could have variation in the amount of air in the boiler every time we brew. Therefore, if you attempt to pre-Infuse when the boiler is not properly full, you will have great negative effect on the extraction. In particular when trying any Pre-infusion (with time pause), It can dampen water output. Therefore we can have great inconsistency in extractions (volume and temperature). One simple way of improving consistency is to be consistent in how you are refilling the boiler after every use. 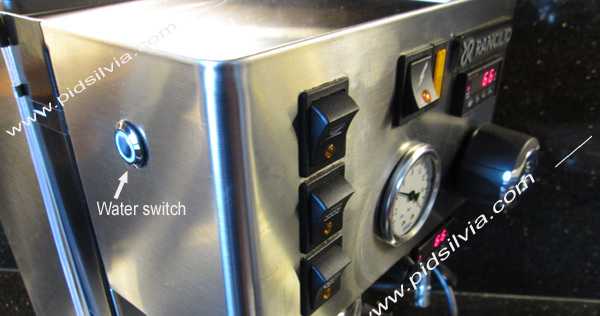 Only using the brew switch (as it state in the user manual) or refilling and purging the air through the steam wand. There are a few ways of adapting Silvia for pre-infusion. One is with a pre Infusion chamber/s, but this option has some negatives such as difficult installation, always having zero water pressure at start of pre-infusion and back flow of water after the pull. A second option is a built in pre-infusion timer in the PID unit or on an external timer, like a countdown switch. I find this option also has some negatives, such as the lack of flexibility to pull a longer shot or to cut off short as needed during the pull. Sometimes you may need 18 second and sometimes as much as 30 or 40 seconds. The third option is a combination of electrical switching, with the user manually activating the pump as needed, together with monitoring the extraction and the pressure at the gauge. I think the third option is the best compromise because you can run the pressure at any range from zero to maximum, sequence the pump and the water to the puck and pull the shot for any length of time. Can be added to any Silvia--new, old, with PID, or without PID. 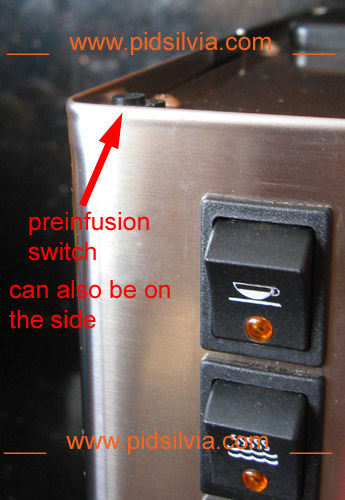 This pre-infusion switch is safe and simple, works on a low voltage. (do not try this at home, on the high voltage side). The ULKA water pump can continue to be activated by the original water switch (middle switch), or a new push button switch can be installed to do the job. 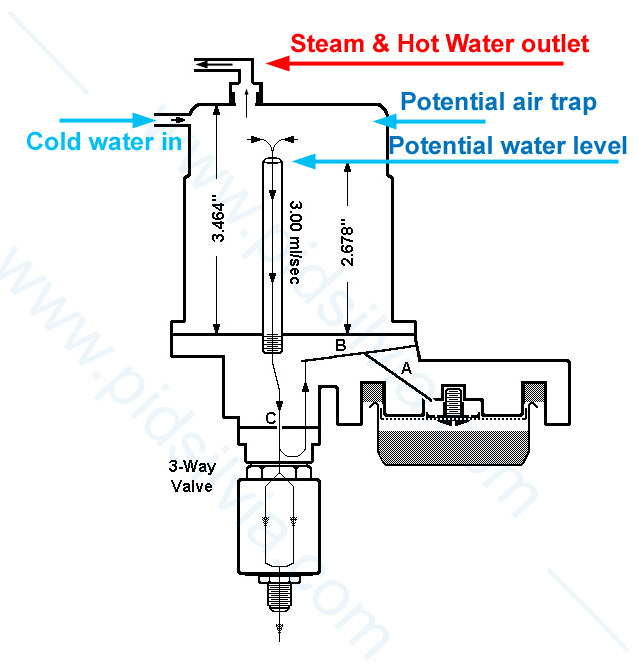 For best results, you will need an in-line pressure gauge also installed, to help you regulate the water flow. See picture below with a side switch. Preinfusion, Rancilio Silvia, Bottomless, nice clip. One other more practical option is, using Silvia’s own switches as you can see in the video below. This will require an additional electrical wiring modification. Do Not try this without the electrical wiring modification (it will not work). Bear in mind that the ability to predict timing is no guarantee of a good shot. What is critical is knowing when to stop the pull for the particular coffee blend, grind and volume and water temperature. Always remember that bitter, harsh, astringent taste is the result of over extraction. Over extraction may be caused by (a) too long of an extraction (too much water by volume passing through the puck or even through a single spot or area of the puck), (b) uneven water distribution in the puck due to cracks, and/or (c) uneven grind distribution or density.